HOUSTON, TEXAS (October 28, 2017) The Northwestern State Demons kicked a 36-yard field goal with three seconds remaining game to down the Houston Baptist University Huskies by the score of 10-7 at Husky Stadium in Houston on Saturday, October 28, 2017. 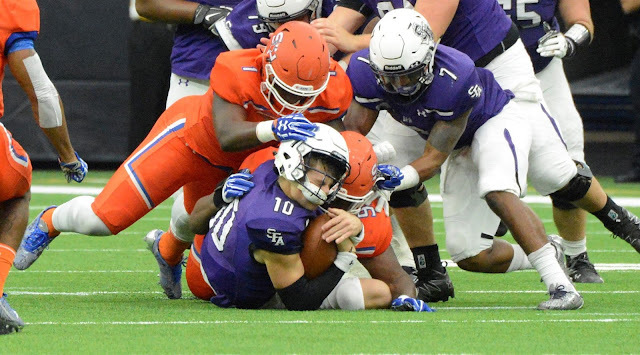 After 55 minutes of scoreless football, both the Houston Baptist University Huskies and Northwestern State Demons scored in the final five minutes of regulation. The Demons took the final kickoff of the game; moving the ball 29 yards in five plays to boot the field goal and pick up their first Southland Conference win of the season. The first three possessions by the Huskies ended with fumbles, but HBU found that fate swung back in their favor when the recovered a Demon fumble at the 10:28 mark in the second quarter. They began their fourth drive of the game on their own 40-yard-line. Being unable to secure the first down, the Huskies were forced to punt and give the ball back to Northwestern State. The Demons were also unable to capitalize on the possession when safety Nicholas Smith found himself in position to intercept a Clay Holgerson pass; returning it to the the Demon 31-yard-line. After three plays, the Huskies attempted a 50-yard field goal; which was low. Northwestern State took possession of the ball. They ended the drive with their own field goal attempt; which was wide left. With 1:11 remaining in the half, HBU took possession to close out the first half. The second half was pretty much a continuation of the first half; minimal offense and mistakes on both sides. Nonetheless, both squads tried very hard to find any weakness in their opponent's defense to get the ball over the goal line or between the uprights. The Demons finally would the opening with 4:55 remaining in the game when Chris Jones rushed up the middle for 23 yards and the touchdown for the score. Eric Piccione added the kicking conversion to give the Demons a late 7-0 lead. HBU took the kickoff and began their drive on their own 29-yard line; driving 71 yards in 13 plays to tie the score; on a two-yard pass from Bailey Zappe to Terrance Peters with 1:05 to play. NSU took the kickoff and moved the ball down the field to kick the field goal for the win. 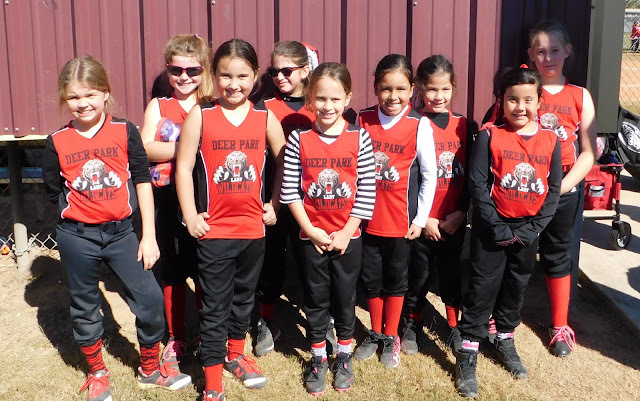 DEER PARK, TEXAS (October 29, 2017) The Deer Park Lady Wildcats 8U softball team competed in the Deer Park Halloween Bash Tournament on Sunday, October 29, 2017. The tournament, which started on Friday, October 20 and continued on Saturday, October 21, before being postponed due to torrential rain fall in the Houston and Gulf Coast area. In their first game of the tournament, the Lady Wildcats downed Deer Park Pink by the score of 7-2. They advanced to the second round of the tournament, and dropped a close 8-6 decision to the Deer Park Ravens.. The tournament was postponed at this point, with play being resumed on Sunday, October 29. Coming from behind in the middle innings with their hot bats, the Lady Wildcats close an early four-run gap by the Deepwater Xplosion before dropping a 12-6 decision for their second loss of the tournament. Emilee Mendoza, Lexie Lorillard, Savannah Brown, Trinty Choate, Aaliyah Agan, and Kensley Hyland provided excellent defense during the tournament. The tournament was hosted by Deer Park Girls Softball and played at the Deer Park Softball Complex on X Street in Deer Park. The Lady Wildcats are coached by Jimmy Stokley and Chad Hyland. HOUSTON, TEXAS (October 22, 2017) The Houston Dynamo made the decision to take possession of their fate on MLS Decision Day; handing the Chicago Fire a 3-0 loss in the final regular season game for both teams at BBVA Compass Stadium in Houston on Sunday, October 22, 2017. With the win, Houston end the regular season with a 13-10-11 record and as the number four seed in the Western Conference. They established a new club record with their 12th home victory and will host Sporting Kansas City in the knockout round on a yet undetermined date. It did not take the Dynamo long to get on the scoreboard, and take an early lead. In the second minute, Leonardo took a long throw in from fellow defender Adolfo Machados heading the ball into the net past Chicago goalkeeper Richard Sanchez for the score. The goal was the second goal of the season for the 29-year-old Brazilian in his 30th game of the season. Heading into the playoffs for the first time since 2013, the Dynamo will face a Sporting Kansas City squad that dropped their final game of the season to Real Salt Lake 2-1. The two playoff squads have faced each other twice in 2017. The first game on October 11, that was postponed from August 26, due to Hurricane Harvey, resulted in a 2-1 win for Houston. On October 15, they battled to a scoreless draw in Salt Lake City. Dynamo head coach Wilmer Cabrera spoken with the press after the match about playing the next game in Houston. 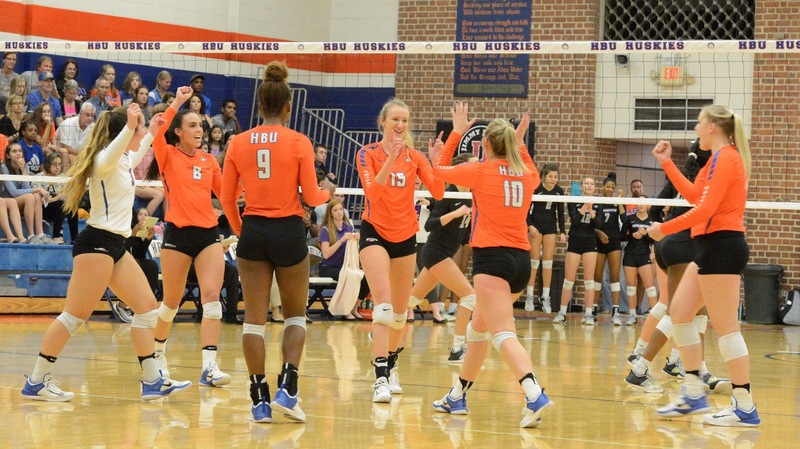 HOUSTON, TEXAS (October 14, 2017) The HBU Huskies rallied from a one-all tie after two sets to down the Abilene Christian Wildcats by the score of 3-1 in Southland Conference volleyball after at Sharp Gymnasium in Houston on Saturday, October 14, 2017. The win pushed the Huskies to 7-2 in conference play and 15-6 for the season. HBU took the first set 25-18 with the Wildcats evening the score at one-all; taking the second set 25-22. The Huskies came back to claim the win, taking the third set 25-23 and the fourth set 25-22. Junior setter Madison O'Brien (Cleveland, Texas, Tarkington High School) led the Huskies with 11 kills on 14 attempts (.714) with senior outside hitter Bailey Banks (Missouri City, Texas, Elkins High School) tallying five service aces and 21 digs. Senior defensive specialist Hailey Erickson (Richardson, Texas, Prince of Peace High School) also accounted for 21 digs. The Huskies are currently third in Southland Conference standing (.778, 7-2); behind first place Sam Houston State (1.000, 7-0) and second Stephen F. Austin (.857, 6-1). Next up for HBU is a October 17 road match against Northwestern State. HOUSTON, TEXAS (October 7, 2017) Christmas came in October for the SFA Lumberjacks as the Sam Houston State Bearkats gifted them with multiple turnovers, but SFA wasn’t in a receiving mood. As a result, 26,792 fans watched the SFA Lumberjacks fall to the Sam Houston StateUniversity Bearkats 27-16 Saturday afternoon at NRG Stadium in Houston. 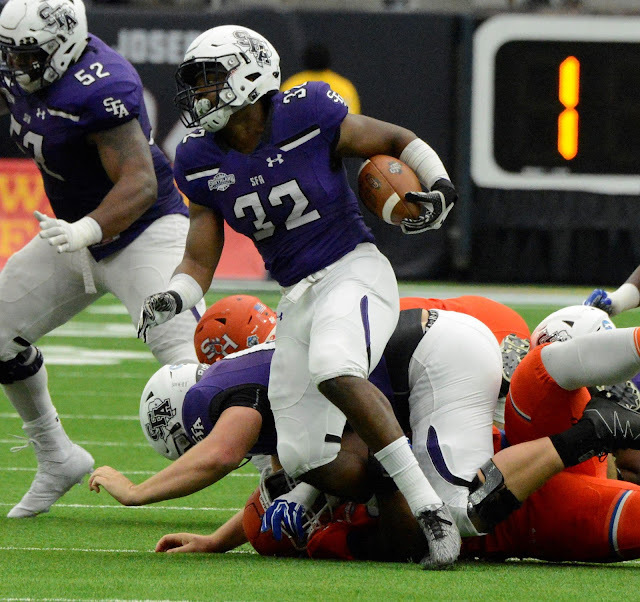 This was the 92nd edition of the Battle of the Piney Woods game and SFA secured their seventh consecutive loss after failing to convert on the Kats’ multiple blunders throughout the game. SFA (2-4 overall, 2-2 Southland) forced four turnovers in the game that could’ve been devastating to the Bearkats, but SFA couldn’t capitalize on the Kats’ mistakes and that proved to be the story of the game. Sam Houston committed 13 penalties that totaled to 144 yards. They fumbled three times, twice on special teams, and threw one interception that lifted SFA out of the dark, but thanks to the ineffectiveness of SFA’s offense, the Kats won their seventh straight BOTPW game and now have a 54-35-2 record over the SFA during this 92 game rivalry. Early in the first quarter the game was shaping up to be a classic blowout. Sam Houston jumped out to a 17-0 lead in the first quarter. Davion Davis, SHSU running back, scored the first touchdown of the game when he rumbled into the end zone from 10 yards out. Sam took 2:47 minutes to run eight plays that totaled 71 yards. Afterwards, quarterback Jeremiah Briscoe and kicker Tre Honshtein added to the lead making the score 17-0 in favor of SHSU after one quarter. Briscoe broke the career record for passing touchdowns (85) for SHSU after his first quarter touchdown pass. SFA gained 9 yards and SHSU gained nine first downs during the first quarter. SFA came into the second quarter with a different mindset. Sophomore safety, Alize Ward, intercepted Briscoe’s pass and returned it for 52 yards setting SFA up inside the 20 yard line. Storm Ruiz, kicker, would make a 42 yard field goal giving SFA their first score of the game. On SFA’s next possession, Blumrick hooked up with Tamrick Pace for a 58-yard gain. That pass led to Blumrick jumping into the end zone from the one-yard line. That cut the SHSU lead to 17-10 with 3:19 left in the first half. SFA would go into the half down 20-13 after both team’s swapped field goals. After a bevy of miscues that included interceptions, ejections, fumbles and confusing challenges, the Jacks were in position to tie the game at 20 midway through the fourth quarter. Blumrick got the team into the red zone after he hooked up with receiver Frank Iheanacho for a 35-yard gain. Blumrick went through his progressions during the drive on the goal-line and threw a pass into the back of the end zone intended for Cody Williams, but Danzell Sims intercepted the potential game-tying TD pass and ended all hopes of a Lumberjack upset. SHSU would score late in the fourth quarter on a 26-yard TD run by Briscoe. The SFA defense was simply fatigued and Briscoe was able to slip away and score to dagger touchdown. Blumrick completed 18 passes for 205 yards. Pace caught 6 passes for 100 yards. Ward has recorded three interceptions on the season which ties for the most in the SLC. SFA will gather themselves and take their talents to Conway, Arkansas. The Jacks will battle the eighth ranked Central Arkansas Bears. This game will be featured as the SLC Game of the Week and will be streamed live on ESPN3. Kickoff is set for 6 p.m. Saturday, Oct. 14, at Estes Stadium in Conway. bracket play in the 9th Annual Gabby Romero Benefit Tournament. HOUSTON, TEXAS (October 6, 2017) The Deer Park Lady Wildcats kicked off the 2017 9th Annual Gabby Romero Benefit Softball Tournament at El Franco Lee Park in Houston, Texas in the 8U division with two games in pool play on Friday, October 6, 2017. In their first game of the evening, they dropped a hard fought 11-4 decision to Deer Park Orange. In the second game, against South Belt Green, they connected for four runs in both the first and second innings that led to a 9-5 win for Deer Park. The Lady Wildcats showed a solid offense and defense against South Belt after overcoming the earlier loss to Deer Park Orange. Kiley Adams, Aislynn Yummit, Bella Stokley, Kensley Hyland, and Aaliyah Agan had stellar performances at the plate, while Emilee Mendoza, Jazzy Garza, Lexie Lorillard, Savannah Brown, and Trinity Choate showed excellent glove play in the field. In addition, Kiristin Kelly showed tremendous skill behind plate as catcher. The Lady Wildcats continue the tournament on Saturday, October 7, 2017, as the No. 3 seed in bracket play, with a 6:45 p.m. start against No. 6 Pasadena Diamond Rippers. The Lady Wildcats are led by head coach Chad Hyland and assistant coach Jimmy Stokley. of approval from the fans at NRG Stadium. HOUSTON, TEXAS (October 1, 2017) In a game that saw no players kneeling during the National Anthem, the Houston Texas scored two touchdowns in the first quarter and went on to down the Tennessee Titans by the score of 57-14 at Houston's NRG Stadium on a beautiful Sunday, October 1, 2017 afternoon. The 57 points was a franchise record for the Texans and pushed their season record to 2-2 for the season. The 43-point difference is also the largest margin of victory in a game in team history. The previous high was a 34-point drubbing at Tennessee on October 23, 2011. It did not take long for the Texans to jump on the scoreboard, and in this case, capitalize on a Titan mistake during their first possession. On their first possession and a third-and-six play, Titan quarterback Marcus Mariota's pass, intended for Delaine Walker was picked off Andre Hal, who returned it ti the Tennessee 43-yard line. From that point, Houston rookie quarterback Deshaun Watson engineered a four-play, 43-yard drive that ended with a two-yard option rush by Lamar Miller. Along with Ka'imi Fairbairn's extra point, the Texans took a 7-0 lead at the 12:13 mark of the first quarter. After a three-and out drive by the Titans, Houston took control of the ball for their second possession and promptly drove 76 yards in 11 plays for their second score of the game. Watson connected with DeAndre Hopkins on a short eight-yard pass for the score. Fairbairn again added the extra point push the Texans' lead to 14-0 after 9:46 of play. Watson and the Texans continued to rack up points; kicking off the second quarter with a 16-yard pass to Will Fuller V for another six points. Fairbairn again converted the extra point, giving the Texans a 21-0 lead. The Titans finally got on the scoreboard in the second quarter when Mariota drove the ball 75 yards in five plays for their first touchdown; a 34-yard quarterback keeper. Ryan Succop kicked the extra point to cut the Texans' lead to 21-7. Houston responded with a 50-yard field goal by Fairbairn midway through the quarter to increase their lead to 17 points (24-7). The 50-yarder was this longest of the season and extended his team record streak of making his first seven kicks of his pro career. In the final minutes of the first half, Mariota added six more point to the Titan's total with a seven-play, 75-yard drive that ended with another quarterback keeper; a two-yard run for the score. Succop added the extra point to bring Tennessee within 10 points of the Texans (24-14). After the ensuing kickoff and two penalties against the Titans, the second a 52-yard defensively pass interference call which gave the Texans a first-and-goal from the two-yard line. This time, Watson decided to imitate Mariota; keeping the ball and rushing the final two-yards for the score. Fairbairn kick was wide, giving the Texans a 30-14 lead when the half ended. The Texans' 30 first-half points are the second most in team history. The most points scored by Houston in the first half in 34 against Indianapolis on September 11, 2011. At the 6:54 mark in the third quarter, Watson (shown left) again connected with Fuller V on a 10-yard pass; to cap a 14-play, 75-yard scoring drive; along with Fairbairn's extra point; giving Houston a 37-14 lead. After the score, Tennessee replaced Mariota, who was reported as questionable with a hamstring injury, with Matt Cassel. Cassel did little to improve the Titans' performance against the Texans; as Tennessee still had difficulty finding the end zone. Houston added an insurance touchdown and extra point with 11:25 remaining in fourth quarter, when Watson hit Miller with a eight-yard pass for the score. A little less than three minutes later, Fairbairn connected for 40-yard field goal. To add insult to injury; and the very next set of downs, Cassel, with a pass intended for Walker, was picked off by Dylan Cole and returned for a touchdown. Fairbairn added another extra point to his scoring total for the day; giving Houston a 54-14 lead. 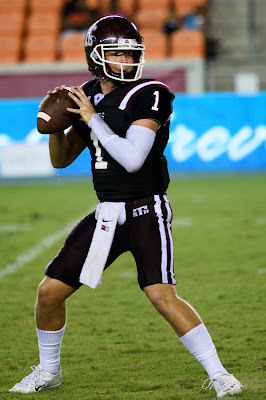 Watson, in only his fourth game as a professional; completed 25-of-34 passes for 283 yards and three touchdowns. In addition, he rushed for 24 yards on four carries and one touchdown. He is the third rookie quarterback with four-plus touchdown passes and one-plus rushing TDs since 1950. Johnny Green first accomplished the feat in 1960; playing for the Buffalo Bills. Fran Tarkenton was the second rookie to achieve that status in 1961, for the Minnesota Vikings. Miller led the Texans on the ground, carring the ball 19 times for 75 yards and one TD. In the air, Hopkins caught the ball 10 times for 107 yards and one touchdown. The Texans' 57 points were the most scored in a game since Green Bay scored 55 points against the Chicago Bears in Week 10 of 2014. HOUSTON, TEXAS (September 29, 2017) The Texas Southern Tigers faced Alcorn State in the second home game of the season on Friday, September 29, 2017, and in a bit of deja’vu from the game against HBU, came close to pulling off a win in the final seconds, dropping a 24-17 decision at BBVA Compass Stadium on Friday, September 29, 2017. The second half scoring was even with TSU and Alcorn Scoring a touchdown apiece in the 3rd quarter and each with a field goal in the 4th. As the final seconds counted down, quarterback Dominic DeLira’s (shown right) rookie play caught up with him. 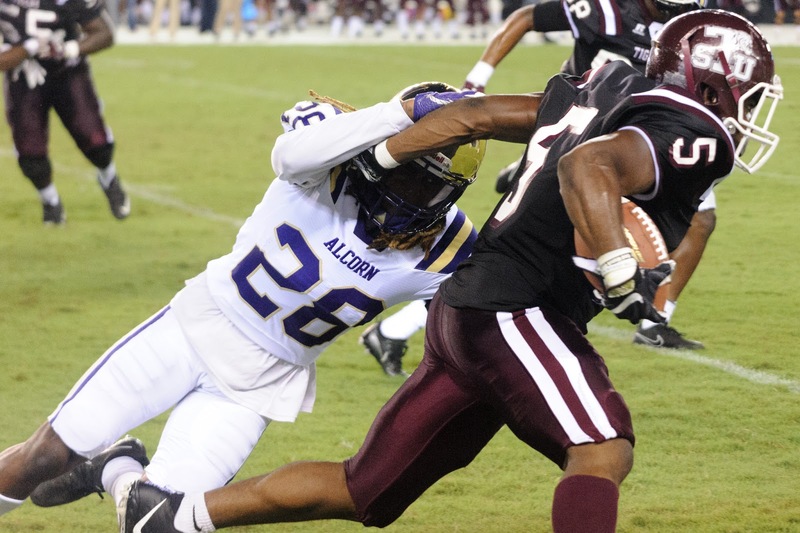 Alcorn’s defense shut down the final pass that, while ruled incomplete, was almost intercepted anyway, ending the game 24-17. DeLira had some bright spots with ab admirable eight third-down conversions, 17 first downs; just shy of Alcorn's 20-yard line, and 295 yards from 71 plays, with the assist of runnung bacvcl Brad Woodard; with whom he traded off the snap for a few special plays; one of which caught Alcorn off-guard. October 7, 6:00 PM at Fifth Third Bank Stadium. fans at BBVA Compass Stadium. HOUSTON, TEXAS (September 30, 2017) The Houston Dynamo and Minnesota United FC battled for 69 minutes of back-and-forth action before forward Alberth Elis took a pass from Vicente Sanchez and headed it past Minnesota goalkeeper Bobby Shuttleworth to give Houston a 1-0 in the 69th minute in route to a 2-0 win at BBVA Compass Stadium on Saturday, September 29, 2017. The win pushed the Dynamo's record to 11-10-10 (43 points) and keeps their playoff hopes alive with three regular season game to go in 2017. Houston added the insurance goal 16 minutes later when forward Romell Quioto headed off another Sanchez corner. Head coach Wilmer Cabrera talked about the match after the win. The win gives Houston a 10-1-4 record at home this year and Cabrera is 21st win as an MLS head coach. It also improved the Dynamo's record against Minnesota to 1-0-2 overall and 1-0-1 in Houston. In addition, it gave Houston their first win over Minnesota head coach Adrian Heath, who was 1-0-1 against the Dynamo with Orlando City and is 0-2-2 with Minnesota. Elis' goal was the tenth of the season and makes him the sixth player in Dynamo history to hit double-digits in a single season. Quioto's goal was his sixth goal of the season. Sanchez's two assists gives him an assist in four consecutive games.